When I first saw the theatrical trailer of Salman Khan's latest offering, Dabangg, I knew the viewers were in for a ride. A ride filled with full-on dialogue-baazi, pulp-inducing fights, unrealistic plot and very little logic, if any! After all, for the majority of his career, that's the sort of Cinema Khan has done. And it's not out of necessity, mind you. It's almost by design and a conscious choice on Khan's part. A choice that has landed him firmly into the hearts of the masses and taken him as far away from new-age Hindi cinema as possible. If one were to pen down a list of Bollywood's better actors, I doubt Khan would find his name on the list. He has shown enough flashes as an actor that leads me to believe that he can outshine the mightiest of performers should he really want to but he has consistently seemed content with putting in average performances. And, ironically, he's always seemed fine with that for he's hardly taken his acting, career and/or fame seriously. This attitude clearly reflects his choice of movies and his bare award cabinet is witness to that (not that there's much credibility left to any Bollywood Awards these days). He's a fine actor when he wants to be, but by and large, he's a star and perhaps the biggest in India in the purest sense of the word. That's how Sallu Bhai rolls and that's why the masses love him. He has always played to the galleries and that's exactly what he does in Dabangg as well. Aside from being a movie, Dabangg is more of a case study into the B-grade school of film making. If Robert Rodriguez was in Bollywood, this is exactly the kind of movie he would have made. Dabangg sells a character to its audience - a character that is made up of all the cliché’s one can associate with this genre. Khan's Chulbul "Robin hood" Pandey comes from the family of larger than life heroes who ruled Hindi Cinema back in the 70', 80's and early 90's until the likes of Yash Chopra, Sooraj Barjatya and Karan Johar replaced the Vijay's, Veeru's, Jai's with Rahul's, Samir's and Prem's in the late 90's. Gone were the days where a hero's entry would be greeted with whistles and cheers by the Hoi Polloi quotient of the audience. The whistles and cheers were seamlessly replaced with sighs and gushes of girls and aunties alike. Multiplexes were born and single screens pushed aside. A younger (and more sophisticated) generation of film-makers, with fresh ideas, forced its way through and family audiences became the target audience. Samosa's and peanuts gave way to popcorn and fountain drinks. Hindi cinema was progressing and production houses, backed by International Studios, replaced the individual producer. However, lost and neglected in all this commotion has been a genre which the new-age film makers have termed too outdated for the increasingly "smarter" audiences - A genre where the hero single-handedly beats an army of 100 goons without breaking a sweat to the delight of those watching in the theatre or at home and no one dare questions the logic and laws of physics while he's at it. Look, I am sure that Raj, Prem and Rahul are all nice guys - but Vijay they're not. The hysteria that Amitabh Bachchan's angry young man persona and countless hits used to create back in the day hasn't been evident over the past two decades. I am all for progression of cinema and infusion of reality and sophistication into movies. Audiences have grown smarter and want to watch stuff they can identify with and fathom. However, there will always be enough room and viewership for movies of all genres’ including B-grade heroism - the trick is to package and present the Vijay of yore in a new avatar. That's where Dabangg succeeds. Chulbul Pandey is essentially Vijay re-incarnated but with today's attitude. 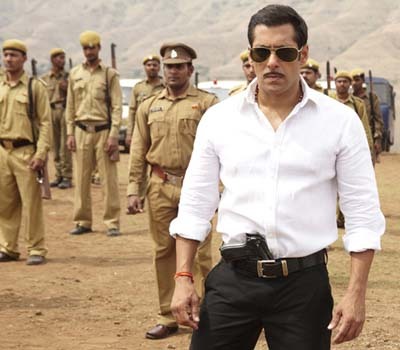 Accessorized with slick dark aviators and a 'stache that stands out, Chulbul Pandey is a role tailor-made for Khan and to his credit, Khan does wonders. The role never demanded histrionics as Chulbul Pandey feels more like an attitude than a character - an attitude that's not easy to pull off and not many actors could have created the impact Khan creates. He lets his sheer screen presence breathe life into Chulbul Pandey and is clearly having way too much fun while he's at it. Be it bashing the baddies or indulging in an awkward romance with Rajo (a confident Sonakshi Sinha in her big screen debut) or mouthing off Dileep Shukla's cleverly-penned dialogues or dancing to Sajid-Wajid and Lalit Pundit's well-etched tunes, Khan's Pandey charms our pants off. Chulbul Pandey is the selling point of the movie and the makers were smart enough to market the character instead of the movie. However, I wish an equal amount of effort was put into sketching the rest of the characters in the movie. All the characters outside of Chulbul seem half-baked and could surely have done with a little more detail that would only make them more interesting. Vinod Khanna, Dimple Kapadia, Anupam Kher, Om Puri, Arbaaz Khan and Tinu Anand all play under-developed characters and at times, come across as mere props used to aid Pandey's character development instead of their own. These artists are far too accomplished to play such ill-defined roles. They all try hard but lack of characterization limits their efforts. There's not much in the name of story or logic here but it doesn't really matter in the grand scheme of things as the viewer is having just way too much fun watching Pandey do his thing and one doesn't seem to mind the glaring loopholes in the narrative. Director Abhinav Kashyap puts in a decent shift as a First-time director and has cleverly chosen a subject and genre he seems comfortable with. Dabangg is his homage to the Prakash Mehra / Ramesh Sippy / Manmohan Desai brand of cinema and a good one at that. Additionally, holding Salman Khan's interest throughout the making of a movie is no cake walk yet Kashyap not only manages to keep his star focused, but (GASP!) also gets him to keep the same look (read: hairstyle) throughout the movie. That must be a record of sorts as I don't remember Khan maintaining a consistent look in any of his past outings barring, perhaps, Tere Naam. Right from when it’s promotion started, Dabangg seemed more than just a movie - it seemed like an experience. That's exactly how one needs to watch it. Those looking for logic and a screenplay devoid of any loose ends will be thoroughly disappointed. But those looking for a great movie-going experience will lap Dabangg up with both hands. Move aside Rahul and Raj, Chulbul Pandey is here! And if the box office response is anything to go by, he'll be sticking around for a while. Just leave your thinking caps at home, walk into your nearest theatre, bring out the Samosa's and Chutni and experience Chulbul Pandey in his full glory. The whistles and cheers are back.... And we all have Salman Khan to thank for it!